How Many Users Can Your High Density Wireless Network Support? Find Out Before you Deploy. Recently I wrote an article on how tough it has become to deploy wireless technology in high density areas. It is difficult to predict final densities until fully deployed, and often this leads to missed performance expectations. 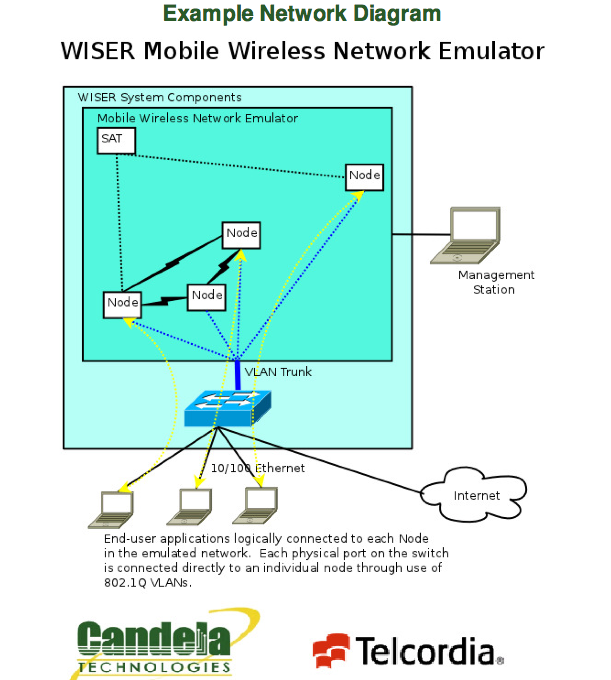 In a strange coincidence, while checking in with my friends over at Candela Technologies last Friday , I was not surprised to learn that their latest offering ,the Wiser-50 Mobile Wireless Network Emulator, is taking the industry by storm. So how does their wireless emulator work and why would you need one ? The Wiser-50 allows you to take your chosen access points, load them up with realistic signals from a densely packed area of users, and play out different load scenarios without actually building out the network . The ability to this type of emulation allows you to make adjustments to your design on paper without the costly trial and error of field trials. You will be able to see how your access points will behave under load before you deploy them. You can then make some reasonable assumptions on how densely to place your access points, and more importantly get an idea on the upper bounds of your final network. With IT deployments scaling up into new territories of densities, an investment in a wireless emulation tool will pay for itself many times over. Especially when bidding on a project. The ability to justify how you have sized a quality solution over an ad-hock random solution, will allow your customer to make informed decisions on the trade -offs in wireless investment. The technical capabilities of Wiser-50 are listed below. If you are not familiar with all the terms involved with wireless testing I would suggest a call to Candelatech network engineers, they have years of experience helping all levels of customers and are extremely patient and easy to work with. Complete Scenario Definition to add nodes, create mobility vectors and traffic profiles for run-time executable emulation. Runtime GUI visualization with mobility and different link and traffic conditions. Automatic Traffic generation & execution through the GUI. Drag-and-drop capability for re-positioning of nodes. Scenario consistency checks (against node capabilities and physical limitations such as speed of vehicle). Capture and replay log files via GUI. Support for 5/6 pre-defined scenarios. Support for adaptive modulation/coding for BER targets for ground-ground links. Support for MA TDMA (variants for ground-ground, ground-air & satellite links). Support for minimal CSMA/CA functionality. Support to add effects of selective ARQ & re-transmissions for the TDMA MAC.